Be the first to share your favorite memory, photo or story of Roy. This memorial page is dedicated for family, friends and future generations to celebrate the life of their loved one. 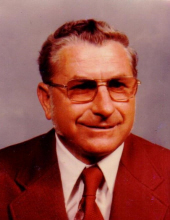 Roy Dewitt Rusmisel, Sr., 95, of Harrisonburg, passed away Tuesday, January 29, 2019 at Curis in Harrisonburg. He was born in Mt. Solon on July 3, 1923, and was a son of the late Roy Arnold and Pansy (Landes) Rusmisel. Roy served his country in the U.S. Army National Guard, and worked as a carpenter for Nielsen Builders. He loved to hunt and fish and was a member of Woodmen of the World. He was a member of Bethlehem Brethren Church. On October 10, 1981, he was united in marriage to Eleanor Mae (Hanger) Rusmisel who survives. Surviving in addition to his wife is his son, Roy Dewitt Rusmisel, Jr. and wife Deborah, of Stuart; step-sons, David Charles Shifflett, Donald Wayne Shifflett and Gary Wayne Shifflett, all of Harrisonburg; two sisters, Mary Elizabeth Hilbert, of Maryland, and Dorsilla Higgs, of Harrisonburg; a brother, Bobby Rusmisel, of Bridgewater; three grandchildren, Leeann Rhodes and husband Darrell of Tobaccoville, NC, Dyan Ragsdale and husband Scott, of Patrick Springs, and Suzanne Torres and husband Jimmy, of Germany; three step-grandchildren, five great-grandchildren, six step-great-grandchildren, and numerous nieces and nephew. Roy was preceded in death by brother, Guy Rusmisel. A funeral service will be held at 2:00 PM on Saturday, February 2, 2019 at Johnson Funeral Service in Bridgewater, with Dr. Thomas Smith officiating. The family will receive friends from 12:00 to 1:30 PM prior to the service at the funeral home. In lieu of flowers, memorial contributions may be made to Bethlehem Brethren Church Memorial Fund, 178 Pleasant Hill Road, Harrisonburg, VA 22801. Online condolences to the family may be shared at www.johnsonfs.com. To send flowers or a remembrance gift to the family of Roy Dewitt Rusmisel, please visit our Tribute Store. "Email Address" would like to share the life celebration of Roy Dewitt Rusmisel. Click on the "link" to go to share a favorite memory or leave a condolence message for the family.